How Often Do I Water Petunias? Proper watering keeps your petunia plants healthy and helps them produce abundant blooms. While these annual flowers have few care requirements, regular irrigation is a must. Deep watering helps the petunias produce long, healthy roots. Watering lightly and frequently is harmful as the petunias grow weak, with shallow roots, which inhibits their ability to seek out moisture and soil nutrients. Petunias bloom all summer when provided with enough water. Petunias grow well from seeds started indoors, but proper watering is vital to ensure that the plants remain healthy and to prevent fungal problems. Keep the potting soil moist during germination. Cover the pot with a clear plastic bag to help retain moisture until the seeds sprout, then remove the bag once the sprouts emerge. Water the young seedlings when the soil surface dries out. Keeping the soil too moist can cause fungus to grow on the seedlings. Plant petunias in well-draining beds. Avoid locations where water tends to collect after rain or irrigation, as petunias cannot tolerate soggy soils. Newly planted petunias need evenly moist soil for the first few weeks after planting, to establish a healthy root system. Once established, reduce watering to once every seven to 10 days. Provide 1 to 2 inches of water at each irrigation, which is enough water to moisten the top 6 to 8 inches of soil. 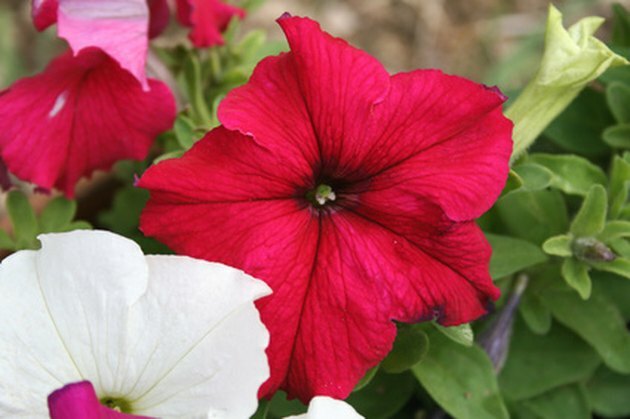 Petunias can tolerate mild drying but the soil shouldn't be allowed to dry out completely. Planters, window boxes and hanging baskets dry out more quickly than garden beds due to the limited soil quantity and evaporation. Check the moisture in the soil daily by sticking your finger into it. Water when the top inch feels dry. Ensure the soil is evenly moist throughout by watering until the excess drains from the bottom of the pot. Smaller containers dry out more quickly than larger containers and may require more frequent watering. Petunias may also require twice daily watering during the hottest part of summer. Mulch helps keep moisture in the soil my inhibiting evaporation. Use mulch on both beds and container-grown petunias. Apply a 2- to 3-inch layer over garden beds and a 1-inch layer over the top of the soil in containers. Organic mulches, such as bark nuggets and wood chips, are attractive, and they also supply nutrients to the soil as they decompose. Mulch also helps prevent weed growth when it's used over petunia beds. 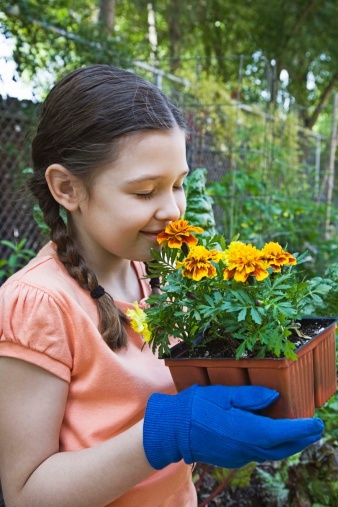 Can You Plant Marigolds in a Pot? How Often Do You Water Marigolds?